Smallmouth bass swim in more streams, rivers, lakes, and reservoirs than any other gamefish, and exceptional, world-class fishing opportunities for them are found across the country, from the John Day River in Oregon to the Great Lakes, to Maine’s Penobscot. 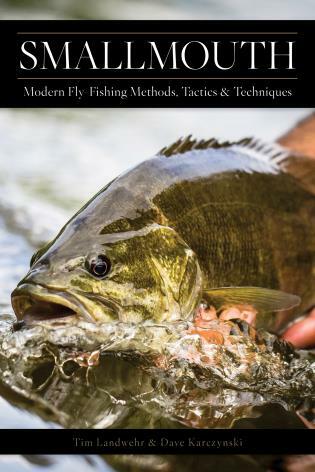 While numerous books have been written on smallmouth, this is the first book to cover the cutting-edge techniques and fly patterns being used by some of the country’s top fly fishing guides. Though most of these flies and techniques have been developed and refined in the rivers and lakes of the Midwest (a hotbed of smallmouth fly fishing) anglers can adapt them for their waters. Writer and photographer Dave Karczynski is a regular contributor to Outdoor Life, Fly Rod & Reel, The Drake Magazine, MidCurrent.com, and many others. He is a Robert Traver Award winner and writing instructor at the University of Michigan. He lives in Ann Arbor, Michigan. Tim Landwehr owns and operates Tight Lines Fly Shop in DePere, Wisconsin. Tim has been guiding for smallmouth bass for the majority of his adult life in the cradle of smallmouth civilization: the brawling freestoners of Northern Wisconsin. He has been featured on ESPN Outdoors, Fly Fisherman Magazine, Gray's Sporting Journal, Catch Magazine, The Fly Fishing Film Tour, The Badger Sportsman, Eastern Fly Fishing, Sporting Classics, and has hosted the Midwest Sportsman television program. He lives in DePere, Wisconsin.